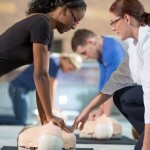 This course teaches the basics of Adult, Child, and Infant CPR. As well as use of the use of the AED. Upon completion of this course students will be able to recognize the signs and symptoms and respond to victims of: Stroke, Choking , and Heart attack. 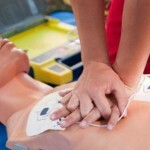 As well as be proficient in the use of: Barrier devices, and the AED. Teachers, Daycare workers, construction workers, pool attendants, corporate staff, Lay responders, law enforcement personnel, security personnel, workplace staff, community groups, boyscouts, family members of cardiac patients, and all non medical personnel. The First Aid Course teaches individuals how to recognize and treat emergencies until advanced medical help can be obtained. Covering topics such as First aids General Principles, Medical, Injury, Environmental, Poison, and Temperature-related emergencies. This course teaches First aids General Principles, Medical, Injury, Environmental, Poison, Choking and Temperature-related emergencies. 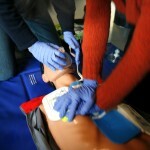 Adult, Child, and Infant CPR. As well as use of the AED.